Raw goldenrod honey in a 1 gallon container which is 12 pounds of honey. Raw honey has not been heated and simply filtered through a large mesh screen. The screen removes larger particles and allows pollen, propolis and beeswax particles to pass through it. Goldenrod honey has been described with a variety of color and taste descriptions. Our goldenrod honey is a light to medium honey in color and has a bit if a bite to it. 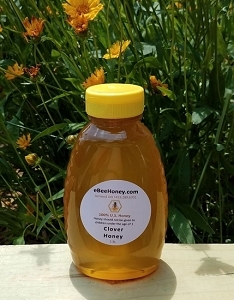 Please read our Honey Description Page to learn more. shipped and delivered quickly. Honey is amazing. Currently fermenting with some apple cider to make a hopefully beautiful apple mead. UPS delivered my package to the wrong address...(no fault of ebeehoney), so I contacted Becky @ ebeehoney and she gladly took care of it immediately! I'm very pleased with the level of customer service I was given, and couldn't be happier with how great the Goldenrod Honey taste! This was my 2nd order, my 1st order was a gallon of Bamboo Honey....which is easily my favorite type of honey now! I'd say the Goldenrod Honey is 2nd favorite! Ebeehoney definitely has a loyal new customer! They have a couple other types of honey I'd really like to try too! This is a very good quality variety for making mead. Perfect sugar concentration. As an amateur beekeeper, with my own flow of wildflower honey out back, I will still be ordering this again for my next brew. Crystallized for now but plan on liquefying and making mead. Your Goldenrod has always been awesome!! I like goldenrod honey for everyday sweetening, it has a light, bright flavor that adds to food without inducing sweetness binging or taking over flavors. Honey was soon good. Don'the hinkle I can go back to clover honey after this. Excellent honey. Will order again. We are a honey loving family and have tried many, many variety of honey and have come to a conclusion that our favorite is the raw Goldenrod Honey. Very healthy and delicious. Our favorite usage is making a simple Honey Tea with the Goldenrod. Add hot water with a splash of milk or lemon and is healthy and delicious! Thank you ebeehoney! Great taste and still pour-able for decanting. Just in time for the onset of goldenrod pollen season allergy attacks. Yes, even in Brooklyn! Just mixed a batch to brew into vinegar. Superb in pickles, marinade and shrub. Best Honey Ever - Raw Goldenrod Honey - Every time I taste it, it reminds me of the Honey my Dad had in a honeycomb in a drawer at home when I was a kid !!!! Just like a song makes you think of past memories, this honey makes me think about being in our kitchen as a little girl !!! I will never buy any other kind !! I do hope you never run out of it. So glad I found this site. Have been looking for this special honey for years !!! My father-in-law had bees, and he kept us in this honey for years, but he passed away at 92 yrs old, a few years ago. So, with him, the honey was gone too !!! Thank you so very much !! Keep up the great work !!!! WE LOVE THESE GALLON JARS! we have tried several varieties of your raw honey in this size because they are all so wonderful and get used up quick around here!! I used to spend a fortune and create much more waste going through small jars so often. THANK YOU! :) Big fans here in MD. This is a great honey with delisious taste and aroma. Thanks ebeehoney for the great product and service. We will be using this goldenrod honey for mead. Always happy with Ebeehoney. I've been making mead for several years now and have tried several different verieties of honey from different apiaries around the country. Although I haven't yet made the mead with this particular goldenrod honey, it has a very robust flavor that surpasses others I've tried, and I'm sure will transfer to the honey wine! High quality varietal honey tends to be difficult to find for a good price and these guys were spot on. I look forward to doing more business with them! Excellent honey. Can't get any better then that. Will order again. This was exactly what I needed to make a 5 gallon batch of mead. High quality and easy to work with. Fast delivery and friendly customer service, I will be using eBeeHoney for all of my honey needs. I grew up eating Goldenrod Honey, so was thrilled to find it, and in a large quantity! I am incredibly happy not only with the honey, but with the customer service, the price, and the fast shipping! I will be back! This is the second gallon I've ordered of Goldenrod. It is very clean and almost looks like it's been spun or creamed in it's crystallized state. It is consistent to the bottom of the jar. I'm very satisfied with color, texture and taste. Raw goldenrod is a honey I will order each year. I use it personally to help with allergy issues; mainly in teas that have cooled -so as not to damage the enzyme activity. I love the flavor, a little stronger than some, not overpowering though, it is one of my favorites! 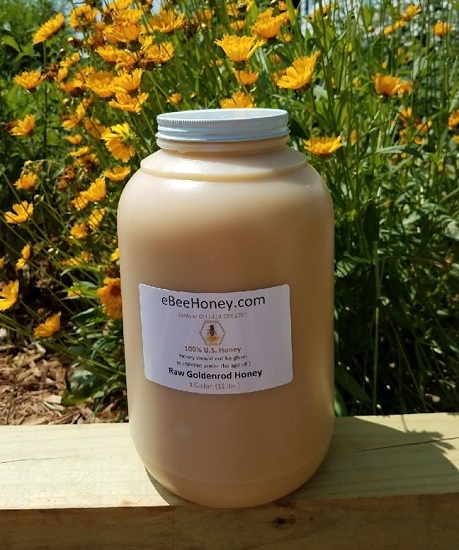 Since goldenrod grows all over, as with other flowers and plants, I don't care so much about "local" honey, just that it is from a good reliable source and is the "real deal" -as it is with eBee! Excellent honey for taste and quality. We attribute eating golden rod honey to helping me build my immune system in fighting allergies. Thank you. Fast shipping, great packaging. Using for long term food storage but I'm sure that the quality is just as good as the service. Love honey and usually buy locally nut way too expensive for bulk. This was raw and delicious. It's currently sitting in a jug with 5 gallons of water and 4 oz of ginger root fermenting away formy first barch of mead. Got s reccommendation to this site from a brew forum and boy these folks don't disappoint. Couldn't be happier with taste and delivery timeframe. Amazing. I first tried this honey from a local bee farm. I love how quick it crystallizes. This has become a family favorite. 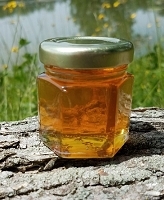 Great quality raw honey, ive tried most varieties and have not been disappointed yet. 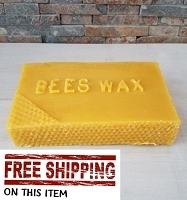 Honey has fast shipping, usually comes within a day or two. I am getting my honey only from these guys and I enjoy raw unprocessed Goldenrod Honey - 12 pounds jar. Service is very good, friendly, and professional. Do not believe I would find better honey then from this company. Thank you.